CentreRight: Why are guidebooks so left-wing? Why are guidebooks so left-wing? Next month, I am going to Egypt for twelve days backpacking through the sights, although in the case of Egypt, "sites" might be more appropriate. In common with tens of thousands of Britons, I have bought a Lonely Planet guide to help me along the way. Twenty years ago, when I bought my first title, Lonely Planet and Rough Guides were in their infancy, but they have since exploded into big businesses. Their basis is perfectly sound - to provide travellers and ex-pats with useful, practical information to make getting around cities, regions, countries and even continents easier, quicker and cheaper. In this regard, they have been a huge success. A visit to your local general bookstore will probably reveal that the travel section is between 10 and 20% of the total storespace, and this seems to be growing. Lonely Planet and Rough Guides dominate the market. Their only problem is this - the books are almost always written from a Leftist political stance. Wait a moment, readers might ask, how can a description of which bus route goes to Tutankhamun's tomb have any kind of political bias? Check out the "history" section of these books, however, and you will see what I mean. Liberal, "progressive" forces are invariably good, battling with the forces of conservatism, all around the world. Most Lonely Planets will give a 20 or so page history, Rough Guides slightly longer. As expected, this is particularly true of guides to the USA and to the UK. Margaret Thatcher and George Bush are vilified. Clem Attlee, Franklin D Roosevelt and JFK are idolised. Pulling a few guides from my own shelves, it didn't take me long to find some glaring examples. Take this one from the 1st edition (1994) Rough Guide to England: in the one page devoted to the history of post-war England, we are told that Margaret Thatcher "created a calamitous number of people trapped in long-term impoverished unemployment. Despite the intense dislike of her regime among a substantial portion of the population, Thatcher won an increased majority at the 1983 election." Perhaps the first and only time that a supposedly hated leader won a democratic election? We are led to believe that the more she was hated, the more her majority grew! We are further told that her one achievement was the Anglo-Irish Agreement ("policy towards Ireland is one area in which the Thatcher regime might be said to have achieved some long-term good") but that meanwhile we suffered "a relentless slide down the league table of industrialised nations". The brand new Lonely Planet guide to the USA (5th ed, 2008) tells us that "Roosevelt did much to ameliorate the pain of the Great Depression", there is praise for Clinton whose attempts to create socialised healthcare were scuppered by the Republicans, who were then out to get him over Monica Lewinsky, etc. But the real monstering is reserved for George W Bush, who "attacked Afghanistan in an unsuccessful hunt for Al-Qaeda terrorists", he "undid environmental regulations" and "fostered a moral, religious and cultural crusade, espousing 'family values'". The chapter introducing California suggests that Arnold Schwarzenegger's only successes were as a result of him distancing himself from Bush, and on it goes. Anyone who uses these books will probably recognise this phenomenon. Pick up almost any title (even seemingly innocuous ones like Norway, which is condemned by Lonely Planet for being too unicultural), go to the history section, especially history since 1900, and you will see what I mean. Some readers of this blog might even ask, it's so well-known, why even bother to write about it? Well, the new Lonely Planet Egypt guide (9th ed, 2008) simply cannot go without comment. The book is an apology for radical Islamism and the Muslim Brotherhood. Any objective view of the Brotherhood is this - it is a jihadist group, whose credo is "Mastering the world with Islam" and "building the khalifa". Leftists, as we know, have often struggled to correctly identify radical Islam. I am not sure, however, that anyone misunderstands it as badly as Lonely Planet do. We are told (p. 44) that "despite their use of religion, Egypt's Islamist groups are part of a political response to harsh socio-economic conditions". They have suffered under "a repressive political system that allowed little chance to voice legitimate opposition" and have been "denied recognition by the state as a legal political entity". 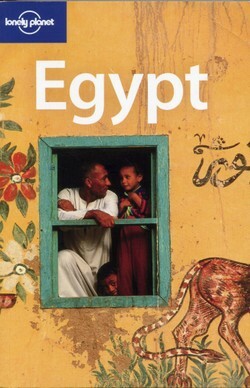 Impressionable young travellers gripping their Lonely Planet might well read no other book about Egypt. Now I can't say I am the biggest fan of the unelected Mubarak government, but surely we can't take the side of the Muslim Brotherhood, the movement which helped give us Egyptian national Mohammed Atta, the ringleader of 9/11? One can't help feeling that the writers at Lonely Planet desperately want themselves to believe that radical Islamists are a manifestation of protest against economic conditions, and are trying to re-arrange the facts accordingly. Perhaps the Brothers really are sitting around in Che Guevara T-shirts, debating the Marxist dialectic, driven by a desire to alleviate poverty, just like the Taliban were in Afghanistan? Why should we care? Two reasons. First, these books sell well, and the market is predominantly young, well-educated people, gap-year teens, students and former students, whose minds are open enough in the first place to embark on a journey to somewhere like Egypt. Probably exactly the sort of people we don't want to be telling that the Muslim Brotherhood are the good guys. Second, and this never ceases to amaze me, we, the British taxpayer, own Lonely Planet. The BBC bought it in 2007. We should be asking the BBC why they are promoting Islamism, and in the meantime perhaps we should persuade Fox News to buy Rough Guides, re-balance the editorial line and give travellers a real choice?